It's grilling season, which means it's also burger season. I LOVE burgers. I lived on them while I was pregnant (bun-less, of course, which is still how I usually eat them) and still crave them often. This was seriously mouthwatering. And in the spirit of full disclosure, I had two of them (again, sans bread). I couldn't help myself. The combination of spices was perfect, and I really love the taste of lamb, so everything together was great. Before I tried it, I thought I'd need a slice of raw onion (a MUST when I eat a standard cheeseburger!) 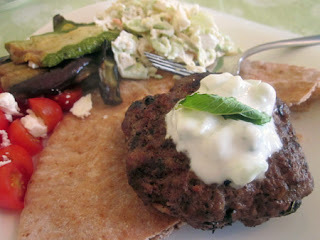 or some feta cheese on top of it...when really, a dollop of tzatziki was good enough. 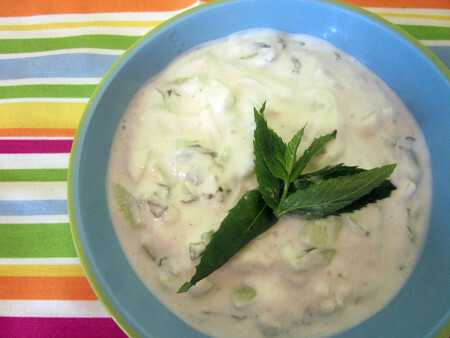 Tzatziki, by the way, is something I've been making for years...I love its versatility. It's great with meats and vegetables, or even as a dip with toasted pita chips. Keep in mind that I am a garlic fiend, so cut back on it if feel the need. I highly recommend that you don't, but hey, your choice. I love that you made these out of lamb! It really and truly is the only meat that I miss...I may have to make an exception for it every once in a while. These burgers look great! Very nice. Looks so tasty! Have you ever salted and pressed the cucumber? I've found that the salting helps drain the water from the cucumber and keeps the sauce extra thick.